This spring season has really motivated me! I’ve been working on project after project. I’m happy to reveal one of them to you today. I've been dedicated to updating my kitchen. When we moved into our home nearly ten years ago, I always dreamed of a bright white kitchen. Over the years we’ve completed a bunch of makeovers, but the kitchen has been on my to-do list for such a long time. It felt so outdated, from the floors to the cabinets. So when CabinetNow.com reached out to me for a potential sponsorship, I could not pass up the opportunity. How could I say no to new cabinet doors? If you’ve been following my blog for a while, you’re no stranger to the journey my kitchen and I have been on. Every so often, I would change a few things here and there, but nothing too complicated. Installing new cabinet doors was a dream come true. I was ready to give my kitchen a completely new look to reflect my evolving taste. Before, the cabinets were flat and dull. Then when I couldn’t take it anymore, we updated them with moulding. This time around, I wanted to streamline the cabinets by having both top and bottom doors combined into one long cabinet door. CabinetNow.Com was a pleasure to work with. I had a large selection to choose from. The ordering process was made simple using a few basic tools. All the measurements were correct and the cabinet doors arrived perfectly packaged. I was impressed with the quality of the doors. The wood was sanded smooth and ready for paint. I painted them in my go-to white paint(Glidden White On White in a satin finish) to match the backsplash and trim. I kept it simple with silver hardware and I am so pleased with how it looks. We chose soft-close hidden hinges and hired out to have them installed. Our contractor/friend worked amazingly fast and efficient. He saved us a ton a time. To break up the pattern, I decided to go with glass cabinet doors over the window. They open up the kitchen a bit and give the space a more custom look. At first, I was a bit nervous about how it would all come together. I didn't want the glass cabinets to become a showcase, rather than a place for storage. Right now, I'm using them to store my favorite glass vases. They can also be used to store my everyday mixing bowls. Before I updated the cabinets, I was frustrated with my kitchen. We made some changes, but the cabinets seemed to be here to stay and I accepted the fact that I would always have to work around them. 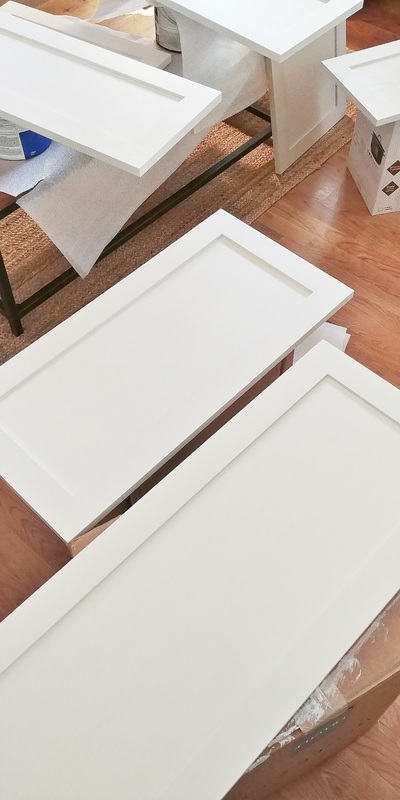 So, when CabinetNow.com wanted to provide me with new doors, I was incredibly appreciative of the opportunity. 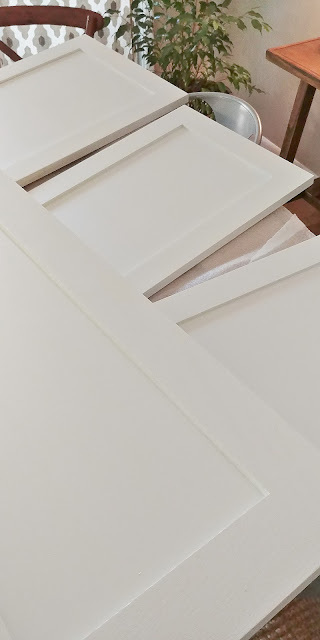 To have new cabinet doors is truly a blessing. CabinetNow.com cabinets are beautiful and of such a great quality. I chose the Shaker style recessed panel doors in a sturdy wood finish. They are made to last. CabinetNow.com takes pride in delivering the highest quality cabinet components available at a competitive price. I loved working with them and I'm so grateful for their support of my blog! It looks so great! Beautiful kitchen! I love your bright white kitchen! Love it!!!!! It’s the perfect spring/ summer update. I saw a preview on Instagram, Brandi and had to come over and see the whole room. It's just beautiful. The cabinets are really beautiful. Enjoy that room! Oh my word, Brandi!!!!! Your kitchen looks FANTASIC now! Wow- what a huge transformation! One wouldnever believe that is the same kitchen. Well done to you and to your sponsor. Love love love it- big congrats! Wow Brandi, it looks like a whole new kitchen! What a gorgeous job! Those make an incredible difference. Gorgeous! Brandi, it is gorgeous! It looks like a complete renovation took place. And, I always love you simple added touches. So much warmth and texture. It's gorgeous, Brandi! Hidden hinges make such a difference and your whole kitchen is light and bright! Beautiful transformation! Beautiful Pictures; your kitchen looks great. Hi Brandi Just saw your May 7th posting.Thanks for the good ideas that i get from looking at them...love especially the cutting boards n bamboo blinds it gives a cosy n vintage look in your kitchen...the baskets under the table is a fantastic idea. So many small switches that at the end turnrd into na super elegant Kichen.